2014 has started and it promises to be an exciting year for television. January alone is packed with returning shows and midseason is just around the corner. Before I get wrapped up in the madness of the new year, I wanted to take a look back at 2013. A couple of years ago, shows getting “uncancelled” was completely unheard of. I would have been the first to say that once a show is cancelled it is never coming back… but… that is no longer the case. First show to get uncancelled was Lifetime’s dramedy Drop Dead Diva. The show was cancelled in January 2013, only to be uncancelled in March. I was very excited about this, and not because I am a fan of the show [I think it is OK], but because it meant “cancellation” is no longer “the end”. Granted, this was probably more about cost-cutting than about fans campaigning, but still… Next on the list was The Killing. After being cancelled in 2012, AMC announced in early 2013 that the show would be returning for a third season. Then AMC cancelled The Killing AGAIN, only to be revived, again, by Netflix! This is VERY exciting for many reasons. First, I never got why critics are so hard on The Killing; I personally love it. Moreover, it is amazing that this show has been “uncancelled” not once, but twice! And it also marks the first time Netflix is “picking up” a show that previously aired on TV. And speaking of Netflix… I remember a couple of years ago (2011-2012) when I was researching new media and Netflix was beginning to toy with the idea of offering original programming. There was A LOT of concerns and skepticism about it. Most people didn’t think the online service could produce quality “TV” and that it would never have shows comparable to the ones on HBO or Showtime [same was said of AMC a decade ago]. Then came House of Cards, LilyHammer and Orange is the New Black; and I think those shows are every bit as good as any cable show! Some people are still against the “online only TV” concept; but I love it. It simply means there is one more outlet for intelligent, edgy TV shows and I am more than happy to pay 8 $/month for it. As if this wasn’t exciting enough, 2013 was also the year of what I like to call “Phoenix shows”. Two of my all-time favorite shows came back from the dead. And by “dead” I mean “extremely premature cancellation of an underrated AWESOME show”. Once again, Netflix made it possible by producing a new season of Arrested Development (7 years after it was cancelled by Fox). Critics were quick to conclude the show wasn’t as good as it was before; even if that is true [more thoughts about this coming soon]; I am ecstatic season 4 happened. Not only we got to see the Bluths again, but it set a precedent: Critically acclaimed shows axed by the broadcast system may have a place online [even years after cancellation]. The second big TV resurrection was not an Emmy winning show, but I was always convinced it was something special. I am talking about Veronica Mars; which is, in my opinion, the best teen show ever made. The show was never the mainstream hit the networks wanted, but it had a cult-following that never gave up on the idea of bringing it back. And it finally happened! The creator (Rob Thomas) and star (Kristen Bell) started a Kickstarter campaign and fans quickly gathered to partially “fund” the movie. Now, I get all the criticism about Kickstarter not being used as intended [to fund small indie projects, not big studio TV shows], but I disagree… if anything the Veronica Mars project made Kickstater known to more people who may be willing to donate money for independent projects in the future. But that is a discussion for another day. Long story short; money was raised, Kickstarter records were broken, the Veronica Mars movie was green-lit, stars fell into place and come March we will see our favorite blond detective causing trouble on the big screen. Yes, I am a huge Veronica Mars fan so it is no surprise I am over the moon about this movie… but even if you are not a fan… isn’t it great to see a fandom finally getting what they want after SO MANY years of campaigning for it? As a side note, maybe you never watched Veronica Mars, but you would be surprised to know how many [now famous] actors started there including: Kristen Bell (House of Lies), Krysten Ritter (Don’t Trust the B in Apartment 23), Max Greenfield (New Girl), Tina Majorino (Grey’s Anatomy), Sam Huntington (Being Human), Leighton Meester (Gossip Girl) and many more… even Aaron Paul (Jesse from Breaking Bad) did an ep back in 2005. 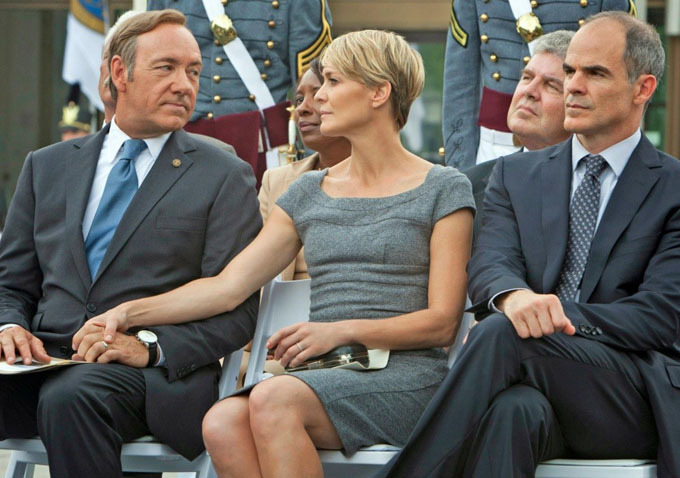 But enough about Netflix… there was still regular TV in 2013 [believe it or not]. This past year marked the end of two cable giants: Dexter and Breaking Bad. I said good-bye to my favorite serial killer with a less than perfect finale… but I thought the season as a whole was pretty strong… Dexter didn’t end on a high note [in my opinion], but it still holds a special place in my heart as one of the boldest shows and part of the “anti-hero golden age” of television. Now… Breaking Bad. If I had to describe the final season, final episode and final scene with one word, it would be PERFECT. 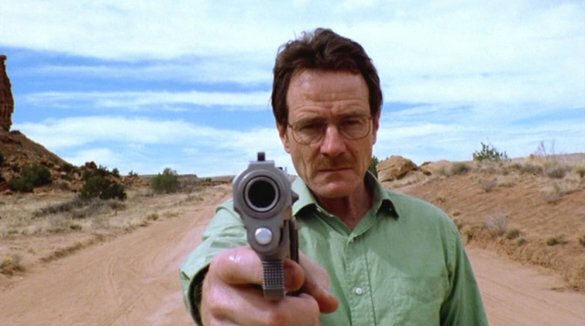 I think, all things considered, Breaking Bad may be the BEST SHOW IN TV HISTORY [runner up Lost]. I love every single thing about Breaking Bad, from the characters to the dialogue, to the tone and pace, to the way it was shot. It is simply perfection, “100% purity”. I didn’t know how you could end such a perfect show in a way that felt satisfying and I have to say Vince Gilligan got it EXACTLY right. The finale had Walt finally “paying” for all the bad things he did, but he still got away with giving the money to his family [admit it, you were all still rooting for him to get away with it…] and there is one final act of redemption as he sets Jesse free [yes! He didn’t die!]. It was sad and cathartic; it was everything a series finale should be. I lost two of my favorite shows, but 2013 also brought me some new obsessions. My favorite new show of 2013 was the first CINEMAX original (Banshee) for which I had zero expectations before it premiered. I also enjoyed the throw-back feel of The Americans [favorite spy show since Alias] and the visual brilliance of Hannibal [from the creator of Pushing Daisies]. Also, some old favorites are still going strong. We got wonderful seasons from Mad Men, Sons of Anarchy, Justified and Game of Thrones; just to name a few. Finally… 2013 was a year of many surprising renewals. Hannibal was one of this… It was surprising because NBC was cancellation-happy last season, but no other NBC show deserved a renewal as much as Hannibal [that show should be on cable!]. The renewal that shocked me the most was probably The Carrie Diaries; and, even though I sort of like that show, I didn’t think it should get renewed because of the ratings. However… surprise cancellations [almost] always make me happy because they imply that net execs are FINALLY looking at other factors besides the ratings… which gives me hope. Of course the “surprise” renewal that made me the happiest was Beauty and the Beast and God knows I did everything in my power to promote that show and get a second season… It’s not like I want to take credit for the renewal, but I do think the committed fandom as a whole was a factor in the decision. I still hope [and I WILL keep the hope until the last minute] that we can pull off an even more surprising renewal this year [I am still banking on that international revenue].